Chemotherapy causes changes in the nails including nail pigmentation, splinter hemorrhage, subungual hematoma, Beau’s lines, acute paronychia and onycholysis. Normal nail growth resumes proximal to distal after all the cycles of chemotherapy are completed. 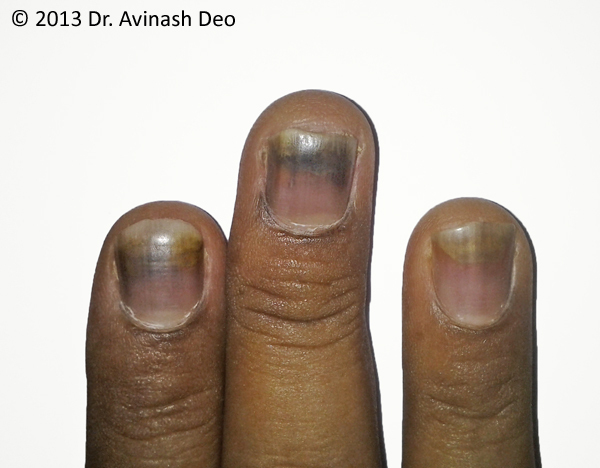 Distal halves of the nails of this patient show chemotherapy hyper pigmentation and onycholysis. The proximal half is normal nail growing after chemotherapy has been completed.